In this Yamaha YDP163B digital piano review, we will be looking at Yamaha’s latest release in its Arius series, the Yamaha YDP163B Arius digital piano. This piano comes with better and improved features as compared to its predecessors’. It is a high-quality instrument that produces amazing sound, great for all piano players of all levels of skill. Let us see exactly what this piano does well and what does not. The Yamaha YDP163B, like other digital pianos in the Arius category, is specially designed to use at home. This is because it is bulky and has an upright design, meant to stay in one place. As we shall see below, this piano comes packed with features that best suits growing players as well as good enough for long time pianists. The Yamaha YDP 163B has Pure CF Sound Technology. The sound sample comes from Yamaha’s famous CFIIIS 9′ grand piano. This means that the YDP163B has the capacity to imitate the feel and sound of a concert grand piano. Another upgrade with the Yamaha YDP163B digital piano is the 192-note polyphony. Having this high number of polyphony gives a much richer sound and allows the player to experience better responsiveness. The piano also comes with Yamaha’s Intelligent Acoustic Control (IAC). This allows playing songs more quietly without affecting or distorting treble and bass tones. This function intuitively adjusts the bass and treble to match up the volume. Yamaha YDP 163B also comes with powerful stereo 20W speakers that further enhance the sound quality. Additionally, Yamaha’s Stereophonic Optimizer greatly enhances the piano sounds through the headphones. This gives a wide and spacious sound as opposed to direct sound of a normal set of earphones. Yamaha YDP 163B comes with 88-key weighted hammer action that feels similar to an acoustic piano. This means that the lower keys are heavier and progress as you move up to the higher keys. The piano also has a new GH3 key sensor, which is extra sensitive and acoustic-like to give more expressiveness. Layer – With layer mode, you can play two different sounds at the same time and in one key. This mode will help you give character and enjoyment to your performances. Duet mode – This allows you to electronically divide the keyboard into two separate parts with equal chromatic scale. This sounds like playing from two distinctive pianos, a great feature for lessons between students and teachers. Split mode – split mode allows you to play two instrument sounds on each hand in a keyboard. For instance, one hand can play vibration, while the other hand plays the piano. This is quite an interesting function that helps the player put together great authentic pieces. The Yamaha YDP163B comes with a USB function that allows connection to your computer or your smartphones. Additionally, Yamaha has apps for iOS devices, which in turn acts as controllers for your digital piano. These apps further give the player more and easier control of the piano’s settings. Another great addition is the inclusion of Bluetooth connectivity, a big plus for this model. Having looked at the Yamaha YDP163B digital piano, I’m inclined to conclude that it has the pretty features and functions ideal for an intermediate pianist. It is an attractive apartment-friendly digital piano that will give you a great piano playing experience. For students that want to upgrade from basic pianos to something more advanced, I believe the Yamaha YDP163B model is the real deal. 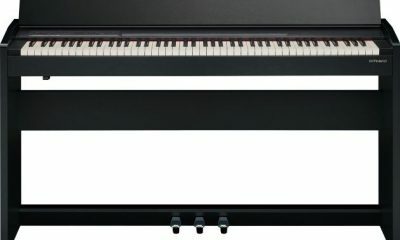 What are your thoughts from this Yamaha YDP163B digital piano reviews? YAMAHA P255 DIGITAL PIANO REVIEW – Best Professional Piano?